Maximize storage and functionality in your kitchen with this chic kitchen cart. Offering plenty of storage space, two open shelves and solid castor wheels, your new kitchen cart acts as a moveable pantry. It's the perfect sidekick for everyday use, as well as for a handy app or beverage station when entertaining. Available in dark cherry with silver-toned hardware. Home Styles Cuisine Kitchen Cart in a cherry finish with a stainless steel top features solid wood construction, and Utility drawer; 2 cabinet doors open to storage with adjustable shelf inside; Handy spice rack, Towel bar; Heavy duty locking rubber casters for easy mobility & safety. Size: 32.5w 18.75d 35.5h. Globe Janitor carts have smooth easy to clean surfaces manufactured from high density plastic for extra durability. Our Carts are ideal for holding dustpans, floor signs, mop handles, and other necessities. Convenient utility hooks are molded directly on the cart and can accommodate most buckets and wringers in the designated storage area. All carts have non-marking wheels, which allow for easy movement especially in tight areas. Perfect for adding extra storage and work space to a kitchen, this Kitchen Cart is a versatile accent. A granite top adds durability and classic style to the cart. A spacious drawer, cabinet area and open shelf provices ample storage space for supplies and gadgets. Durable easy roll wheels allow you to easily move the piece wherever it is needed most. 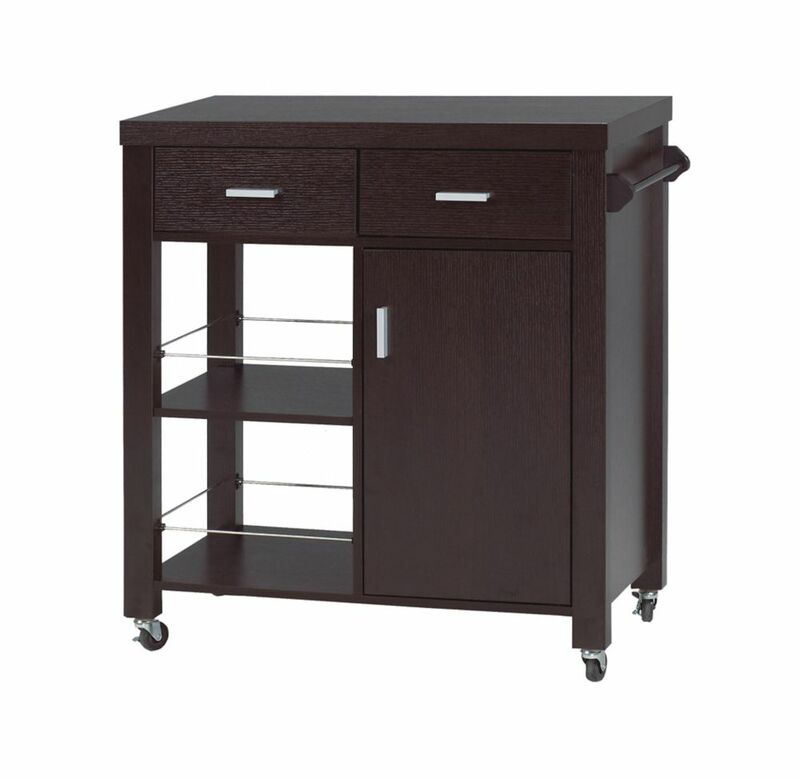 The black finish allows the cart to easily complement any homes furnishings. 300 pound weight limit. Rustic and industrial in style and design, this cart doubles as a Kitchen Cart or Bar Cart and is perfect for adding storage to small dining rooms and kitchens. Crafted from metal, the base of the table features a black finish, while the wood planked top and shelves have a rich brown finish. Storage for wine bottles and glasses adds versatility to the piece. Easy roll casters provide for easy mobility. 300 pound weight limit. Kitchen Cart, Expresso Maximize storage and functionality in your kitchen with this chic kitchen cart. Offering plenty of storage space, two open shelves and solid castor wheels, your new kitchen cart acts as a moveable pantry. It's the perfect sidekick for everyday use, as well as for a handy app or beverage station when entertaining. Available in dark cherry with silver-toned hardware.